This is taken from the Women In Focus ‘Evernote Series‘ Part 1. 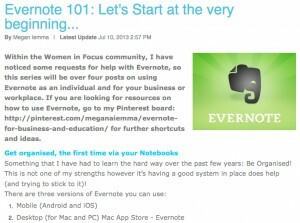 It focuses on the basics of using Evernote and how it can be applied to your business. I wrote the article as a part of a four part series in response to the community asking for some help with using the software. This blog post to date as received over 530 views. Considering this was the first one in the series was really happy with the results. I actively use Evernote and since using the desktop version, have found managing my ‘digital workflow’ a much easier task. Being able to see the whole view on the desktop, certainly makes a welcome change rather than just viewing on the mobile version. The honest truth, is that up until just before writing the Evernote series, I had only ever used the online version and the iPad app. Since then, I alternate between each one depending on where I am working. The mobile app on the iPad is perfect for conferences which is usually where I am most likely to use it (or recording notes from workshops). I love how people often ask what I am using and then confessing that they have it on their devices (smartphones or tablets) but really have no idea how to use it. At the start of June, I had a client contact me regarding some Evernote training, as they couldn’t find someone to run a training session for their staff. They had found me thru the blog posts I had written for Tech Coach HQ. It was fantastic to run a three hour session purely for managers on their iPads. The only issue was that Evernote has three different versions: Online, Mobile and Desktop. Often people forget that there can be limitations between the platforms and to allow for this when working with the software. 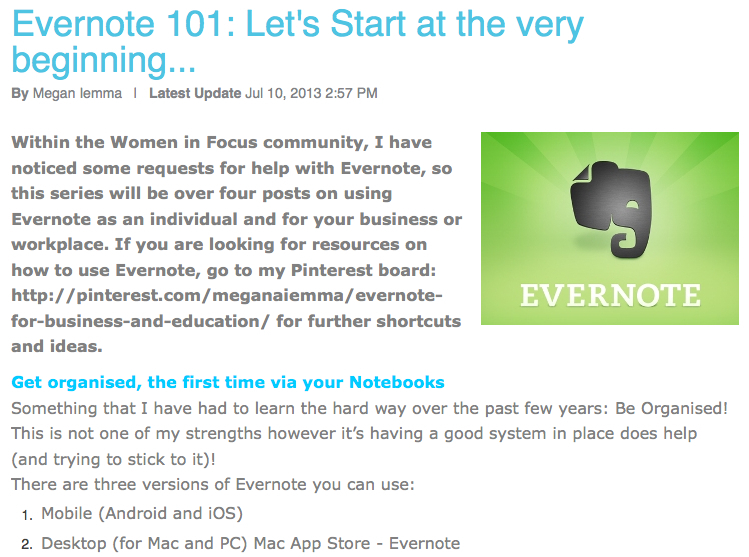 Check out the Women in Focus community and the other three blog posts on using Evernote.